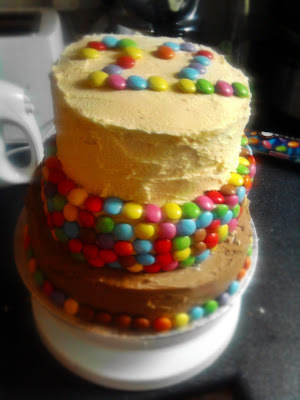 This is the final post from my three-part series about the three-tiered cake I made for some friends' birthdays last weekend (the other two cakes were a Vodka Rainbow Cake and a Mudslide Cake). Naturally, three 22 year-old boys needed alcoholic cakes so the final cake is made with Newcastle Brown Ale. Originally, I was going to make the cake with Guinness, but I still had Brown Ale left in the fridge from when I made the Pineapple Upside Down Cake - I'm not much of a beer drinker. The beer may have been flat, but it still had all of its flavour so I saw no issue with putting it in a cake. Cream cheese icing seems to be the standard for chocolate beer cakes, so I used my favourite recipe, discovered when I made a Carrot Cake back in September. It's a french buttercream with Philadelphia cheese whisked into it; I cannot express just how good it tastes - even if you don't make this cake, I sincerely advise you to make this buttercream and smear it onto something (or as Emma Freud suggested for Salted Caramel Brownies, just go ahead and smear it onto your thighs to save your body the trouble). There is definitely something about beer and chocolate being combined in a cake. 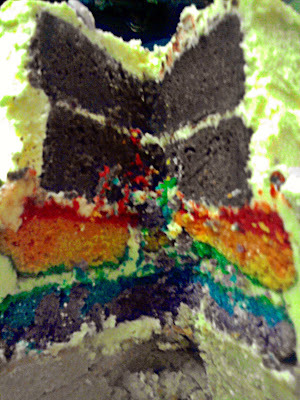 The cake was moist and had a great depth of flavour thanks to the beer; the texture was fantastic. 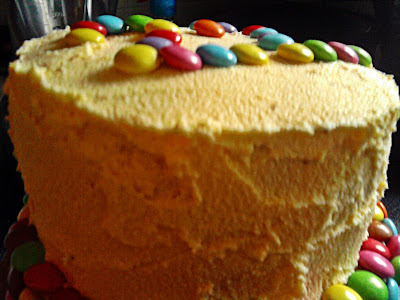 The icing's texture turned airy and fluffy, as opposed to smooth and creamy, when defrosted (rather oddly) but it still worked very well, and as I say it was delicious. The others must have thought so too, as it when I last saw the cake before going home it had the most pieces taken out of it. Preheat the oven to 160C/150C fan and line an 8'' springform tin with parchment paper. Beat in the eggs, one at a time, then sieve the flour, cocoa and baking powder into the mixing bowl and fold in gently until well combined. Pour in the Brown Ale and fold in. The cake batter should now have a soft dropping consistency - if not, add some more beer. Pour the cake batter into the cake tin and bake in the oven for 1 hour 15 mins, or until a skewer comes out clean. Leave the cake to cool slightly before removing from the tin. Allow to cool completely, then refrigerate for 30 mins before slicing horizontally into two. Carefully wrap each slice in clingfilm and freeze for at least four hours (maximum one month). To make the icing, place the yolks and sugar in a bowl over a pan of hot water, making sure that the bottom of the bowl does not touch the water. Make sure the butter is at room temperature and cut it into manageable chunks. Add the butter, a chunk at a time, to the yolks before whisking it in. You should end up with a soft and shiny buttercream that holds its shape. Place one (unwrapped) cake on a serving dish and spread over about a third of the cream cheese. Place the second cake on top and spread the rest of the icing over the sides and top of the cake. Make sure that none of the cake underneath can be seen so that the icing is thick enough. To make the three-tiered cake, I actually stacked the cakes before icing the outside. I sandwiched the different cakes together with the cream cheese icing because I had a lot of excess, but I could have used the icing so that it matched each cake. 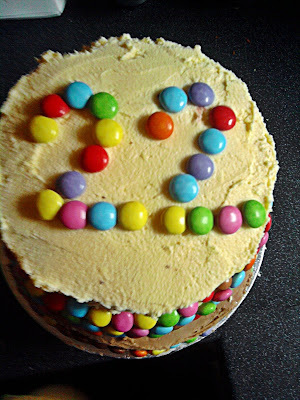 I'd been planning to decorate the Vodka Rainbow Cake with smarties, and in the end decided that decorating the other cakes with smarties would help to tie them together nicely. I will be back later in the week with something Christmas themed - it is December now, you know!